Business owners and managers from all over Northland are breathing a collective sigh of relief now they have submitted their entries for the business categories of the 2018 Westpac Northland Business Excellence Awards. 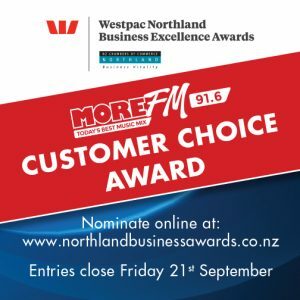 As judging in these categories gets underway, NZ Chambers of Commerce Northland is now accepting nominations for The Northern Advocate Northland Business Hall of Fame, More FM Customer Choice Awards, and the Ministry of Social Development He Poutama Taitamariki Award (Youth Employee of the Year). Public nominations for all categories are being accepted online from Monday 6th August until Friday 21st September. Nominees will find out on Friday 26th October if they will be taking home a trophy, at the Award Presentation and Celebration evening being held at Forum North. This black tie event will again celebrate the Northland business community, and features local food, wine and entertainment. NZ Chambers of Commerce Northland is now accepting nominations for this year’s inductee into the Northern Advocate Northland Business Hall of Fame. This award celebrates the achievement of those people within the Northland business community who have made significant contributions to the region. It recognises those who have, during their business career, demonstrated service both to their industry and to the greater Northland community. It is not necessary that they still live or operate in Northland but that they need to have a strong connection to Northland and preferably where living outside Northland that this connection is widely known. If there is someone that you believe deserves nominating please forward their details to the Chamber (awards@northchamber.co.nz) along with a short paragraph as to why they should be inducted. 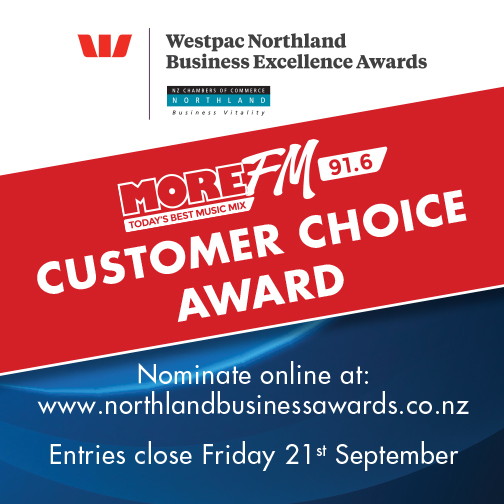 NZ Chambers of Commerce Northland is now accepting nominations for this year’s More FM Customer Choice Awards. Recognition will again be given to the best in both business to customer service and business to business service through two awards; one for Retail and one for Service Providers. These awards are presented to businesses and their staff whose contributions and achievements have made them stand out from the crowd. They are a symbol of the high standards of commitment and service each provides and which people have come to expect. Previous winners are businesses in our own community, who through their hard work and dedication, have been selected by local consumers for their outstanding achievements and standards of excellence. This year businesses who wish to encourage their customers to nominate them for an award will be able to download a digital media kit from the awards website to assist with promotion on their social media channels and website. Public nomination can be made at www.northlandbusinessawards.co.nz. A new category in the 2018 awards, the Ministry of Social Development He Poutama Taitamariki Award (Youth Employee of the Year) provides an opportunity to acknowledge a young person’s achievement in demonstrating excellence in their work and contribution to their workplace, while also recognising the role of the employer in creating conditions for success and sustainability. Be between 18 – 25 years old on 1 July 2018. Nominations and self-nominations are being accepted on the awards website at www.northlandbusinessawards.co.nz, via the online form or by uploading a video entry.